Now is the time for all good men & women to come to the aid of their party! The project is now finally underway with John Wiley & Sons to produce the largest book ever written on Social Media, called The Social Media Bible. The book contains three parts; the first part is an overview of all of the social media components and their history. The third part is how to apply social media to a company to increase revenues. And, the middle part, a reference which is the largest part, are profiles on all of the social media participating companies. Companies like Jott, WordPress, Twitter, Yahoo!, and LinkedIn will be represented in this huge directory / reference bible. We want every company that has contributed in any way to the Social Media Ecosphere included! I need help finding and contacting all of them! I don’t want to miss a single one. Let’s put the value of our own trusted networks to work. PLEASE, text, twitter, Jott, blog, call, and email this to everyone you know! We want every Social Media technology that should be in the guide, in the guide! The initial web site has only just been set up and is really under construction. 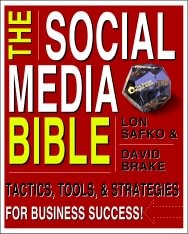 This site can be found at http://www.TheSocialMediaBible.com, and my background is at http://www.LonSafko.com. If you have any questions whatsoever, please contact me at lonsafko@lonsafko.com. Please, help us to be sure that everyone is included.